Dry cooling of coke is known as coke dry quenching (CDQ) and is an alternative to the traditional wet quenching. During wet quenching of run of oven coke, sensible heat of the hot coke is dissipated into the atmosphere and is lost. In addition there are air borne emissions (0.5 ton of steam per ton of coke laden with phenol, cyanide, sulfide and dust) and a large quantity of water (around 0.6 Cu m per ton of coke) is needed for wet quenching. The contaminants in water are also discharged in the environment. In a Coke Dry Cooling Plant (CDCP) red hot coke is cooled by inert gases. The heat energy from the red hot coke is recovered in a waste heat boiler for use as steam, resulting in energy conservation as well as a reduction in coke particle emissions. Around 80 % of sensible heat is recovered. The CDCP process flow is in Fig 1. After pilot and pilot/commercial trials the first full scale CDCP installation was commissioned in 1965 at the Cherepovets Iron and Steel Works in then USSR. By 1978 around 50 CDCP modules of 56 tons per hour were in operation in then USSR. Japan purchased license from USSR and three Japanese installations were commissioned in 1976 – 77. In India MECON purchased license for Giprokoks design CDCP from USSR and the first 12 chambers were installed at Visakhapatnam Steel Plant. The first CDCP plant was commissioned in September 1989. Presently 19 chambers of this design are in operation. Hot coke is brought from the battery to the CDCP in bottom opening bucket kept on the quenching car. This bucket is lifted at the CDCP by a hoisting/charging device to the top of the CDCP chamber and red hot coke is discharged in the chamber for cooling. Hot coke (temperature around 1000 – 1100 deg C) is cooled in the chamber by the inert gas. The inert gas in a continuous running CDCP plant is a mix gas which consists of mainly nitrogen (70 % -75 %) along with small amounts of CO2 (0 % – 15 %), CO (8 % – 10 %), and H2 (2 % – 3 %). In the chamber inert gas moves upwards while the coke moves downward by the gravity. The coke is discharged at the bottom. The passage time of the coke through the chamber is around 5-6 hours and the flow rate of inert gas is around 82,000 N Cu m per hour. 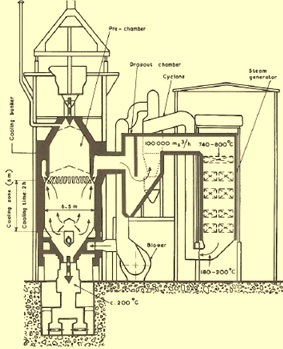 The temperature of the coke at the time of discharge from the chamber is below 200 deg C. The hot inert gas, after picking heat from the hot coke, comes out from the top at around 800 deg C and is conveyed to the waste heat recovery boiler (WHRB) where the sensible heat of the inert gas is used to produce high pressure (around 40 Kgf/Sq cm) and temperature (around 440 deg C) steam (25 tons/hour). This steam produces power in a back pressure turbine. 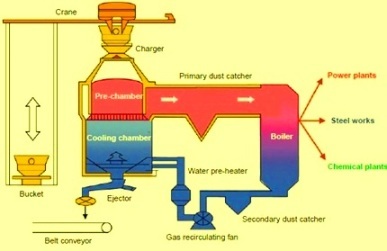 The low temperature circulating inert gas at the WHRB exit is pressurized by a blower and its composition is corrected by addition of nitrogen gas and then the cooling gas is injected at the bottom of the CDCP chamber. The temperature of the cooling gas is around 170 deg C. Other important equipment in CDCP are cut off device for cutting out the coke from the chamber, dust removing system for removing the dust in the circulating inert gas and gas blower. Primary and secondary dust collection systems are installed at the coke charging and the discharging area as well as in the boiler section. Dust emissions are reduced to 50 mg/N Cu m in a bag filter house which is less than 0.09 Kg of dust per ton of dry cooled coke. Sine cooling gas is re-circulated in a closed system there is no air borne coke emissions from gas cooling. Also no dust laden steam clouds are released by the CDCP. This helps in the improvement in the working environment in the area. Fig 2 Coke dry cooling plant module. CSR value of coke improves by around 2 %. In coke produced by dry cooling, the quality of coke is more stable because of low standard deviation (usually around 1.25 %). A uniform quality of coke helps in blast furnace operation. Use of dry cooled coke reduces the coke rate in the blast furnace by around 2 % – 2.5 %. Since the hot coke is cooled gradually by the inert gas, it is free from surface pore and internal cracks normally present in the wet quenched coke. Coke dry cooling is environment friendly as compared to wet quenching since the red coke is quenched by inert gas in a closed system and is equipped with efficient dust removing facilities and such avoids the pollution of the atmosphere. Coke dry cooling generates energy from waste heat. Around 15 -18 MW of power can be generated from a CDCP having a capacity of 100 tons per hour. Since it recovers sensible heat of the coke there is net energy saving. Energy saving is around 0.25 G cal/ton of coke. Since the power is generated by steam from waste energy instead of steam from fuel burning boiler, emission of the equivalent amount of green house gas (CO2) to the atmosphere is saved. Co2 emissions reduction is around 130 Kg /ton of coke. Since the moisture content of coke produced by dry cooling is around 0.2 % as compared to that of around 5 % in wet quenched coke, it helps in reducing the coke rate in blast furnace. Moisture in the coke needs additional heat in the blast furnace for evaporation. CDCP has better reliability and lower maintenance. There is conservation of water. Good literature for cdq understanding. The overall thermal efficiency is 80-85 % which is a very good value. Thank you sir for this useful article. Good technical literature for India industry. Keep it up. It helps everybody student, engineers and managers. Visakhapatnam Steel Plant (VSP) under Rashtriya Ispat Nigam Limited (RINL) – a Navaratna PSU is opearting dry quenching successfully since early 90s. Do you have data of other steel plants globally regarding generation of coke dust per tonne of dry coke ? Maintenance of conventional coke ovens particularly inefficient cleaning of the coke oven doors had been the cause of very poor life of Indian coke oven batteries. What are the maintenance problems and experience in India with dry coke quenching? Kindly explain the potential hazards.